A common part of my examinations includes assessing for abnormal scapular position and movement, which can simply be defined as scapular dyskinesis. Scapular dyskinesis has long been theorized to predispose people to shoulder injuries, although the evidence has been conflicting. Whenever data is conflicting in research articles, you need to closely scrutinize the methodology. One particular flaw that I have noticed in some studies looking at the role of scapular dyskinesis in shoulder dysfunction has involved how the assess and define scapular dyskinesis. Like anything else, when someone has a significant issue with scapular dyskinesis it is very apparent and obvious on examination. But being able to detect subtle alterations in the movement of the scapula may be more clinically relevant. There’s a big difference between someone that has a large amount of winging while concentrically elevating their arm versus someone that has a mild issues with control of the scapula while eccentrically lowering their arm. Most people will not have a large winging of their scapula while elevating their arm. This represents a more significant issue, such as a nerve injury. However, a mild amount of scapular muscle weakness can change the way the scapula moves and make it difficult to control while lowering. One of the simplest assessments you can perform for scapular dyskinesis is watching the scapula move during shoulder flexion. Performing visual assessment of the scapula during shoulder flexion has been shown to be a reliable and valid way to assess for abnormal scapular movement. That’s it. Crazy, right? That simple! Yet, I’m still amazed at how many times people tell me no one has ever looked at how well their scapula moves with their shirt off. You have to use a weight in their hand! 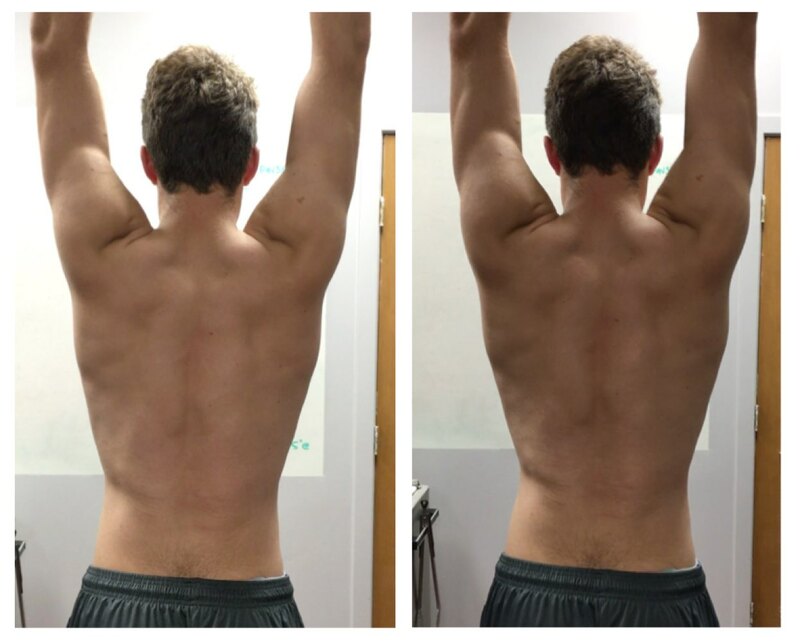 As you can see, the image on the right shows a striking increase in scapular dyskinesis. I was skeptical after watching him lift his arm without weight in the photo on the left, however, everything became very clear when adding a light weight to the shoulder flexion movement. With just a light load, the ability to prevent the scapula from winging while eccentrically lowering the arm becomes much more challenging. This person doesn’t have a significant issue or nerve damage, he simply just needs some strengthening of his scapular muscles. But if you didn’t observe his scapula with his shirt off or with a dumbbell in his hand, you may have missed it! In this month’s Inner Circle webinar, I am going to show you a live demonstration of how I assess scapular position and movement. I’ve had past talks on how to assess scapular position and how to treat scapular dyskinesis, however I want to put it all together with a demonstration of exactly how I perform a full scapular movement assessment and go over things I am looking for during the examination. I’ll be filming the video and posting later this month. Inner Circle members will get an email when it is posted. Click here to join my Inner Circle to gain access to this video and all my past webinars for under $10! Very important and interesting topic. Good tip to use a light weight. Looking forward to the webinar! Interesting – I will bring this up in my Orthopedics class this week, as we are finishing up the shoulder and I’ve never heard the concept of adding a weight to assess scapular motion. I look forward to hearing you speak next weekend at the PBATS Baseball Medicine Conference. Be sure to come say hi next week. Great article, Mike! Awesome example of what a minimal load can do to challenge movement quality. Rate of movement, I have found, similarly challenges the cleanliness of overhead reaching mechanics. Thanks for always providing the best of shoulder training tips with sensible progressions. What is your opinion as to the uncertainty in the literature between the whether scapular dyskinesia is the cause or effect of shoulder pain? If the dyskinesia is secondary to shoulder pain,does a positive finding relevant? Woops sorry about the typos in there! My question: is a positive finding of dyskinesia relevant if it may have been caused by shoulder pain in the first place? Are we sometimes wasting our time trying to correct something that may correct itself if we address the underlying pathology? I seem to be challenged by finding appropriate diagnosis and treatment of scapular dyskinesis. One Ortho said there was nothing he could do and I couldn’t even raise my arm to shoulder height at the time, another that specializes in shoulders diagnosed me with a supraspinatus tear, sent me to a PT and told me I should be well enough to do anything after that…only I feel less aligned and have continuing pain. Any suggestions on finding practioners that are astute in diagnosing and developing the right treatment protocol for scapula dyskinesis? In my personal experience, many of the patients I’ve found with scapular dyskinesia have poor rhomboid activation secondary to impingement of the dorsal scapular nerve from either GH subluxation, over developed UT or strained UT. Once the subluxations reduced or IASTYM’s used to resolve UT tissue limitations the muscle begins to contract correctly and with muscle reeducation It can be corrected.